Why you should go: Experience an ultimate storm surge that will leave no trace of calamity! Get a chance to meet and feel the beat what various DJs, online media personalities from Youtube, bands and more you have to say. 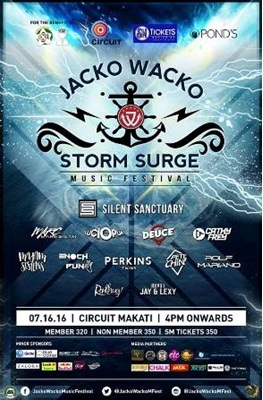 This festival features Silent Sanctuary, Marc Marasigan, Deuce, Lucio Pua, Cathy Frey, Perkins Twins, Majam Sisters, Rolf Mariano, Pete Chin, and Enoch Puno. Other details: Gates open 6 p.m. Tickets at P350 available at SM Ticket Outlets. Silent Sanctuary, Marc Marasigan, Deuce, Lucio Pua, Cathy Frey, Perkins Twins, Majam Sisters, Rolf Mariano, Pete Chin, and Enoch Puno.